Yay – another game played! Any way – we played the Somme Campaign some 6-7 times – it was the first time Kevin played it – and we swapped sides and won and lost as both. Kevin enjoyed the game, and thought it worked – high praise indeed!! We played a 400 point of Battlegroup as well. 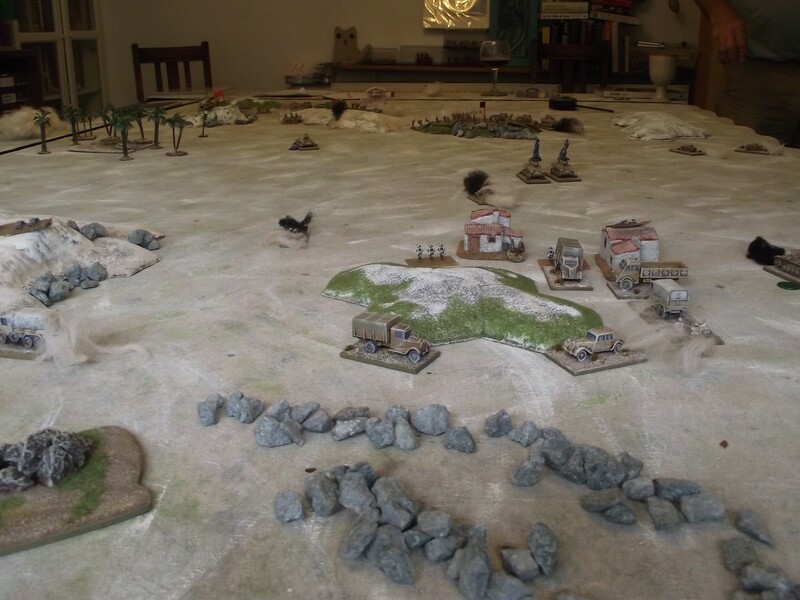 An attack/counterattack scenario with random rolled terrain, and random (care of Goswinks) objectives. Here is the game from my end. 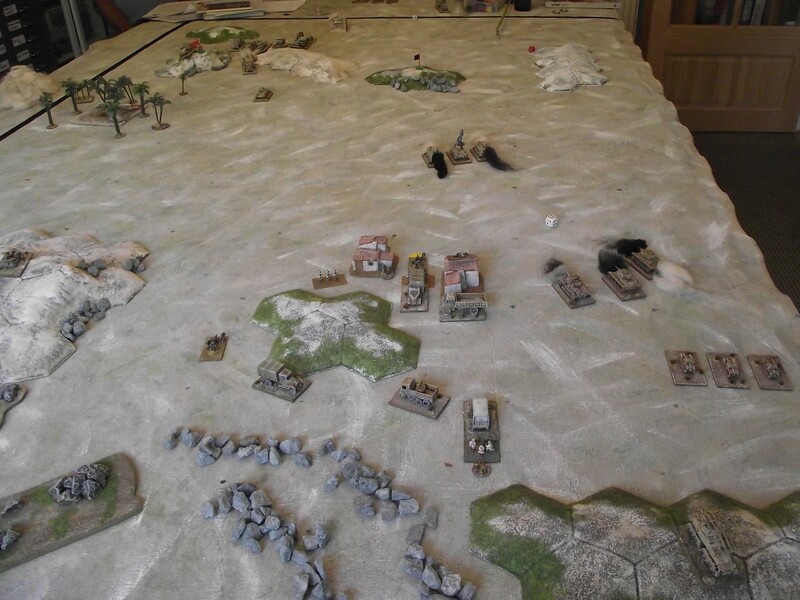 I was playing the German/Italian force – I moved on with a PZIIIG platoon and a Bersagaleri section, behind were a CV35 platoon, anti tanks guns and another Bersagaleri section. I was against it as the majority of objectives were on Kevin’s side. 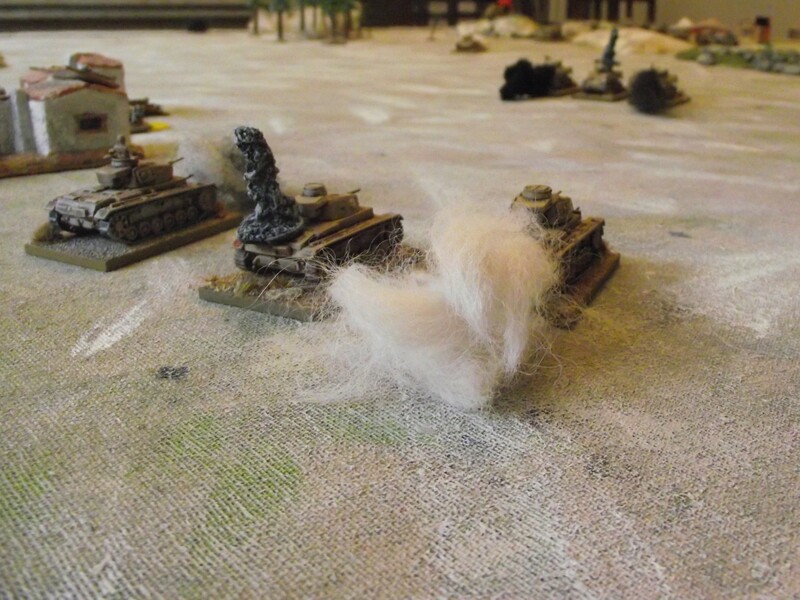 Kevin fielded a platoon of Honeys and a Matilda – plus I think, two sections of infantry plus a few guns………not really sure as the Honeys and Matilda did a job for him. Here his Honeys engage my PzIIIG’s – who did well and knocked out 2 of them for one lost. Then he played his trump card – out of petrol – one of my PzIII’s was immobilized, and one had a breakdown. I was stuffed – couldn’t go any further with my iron fist hamstrung. I tried to move the cv35’s round the flank to get to his soft bodies of troops but the last remaining Honey dealt with them. PzIIIG’s and CV35’s brewing up………………. 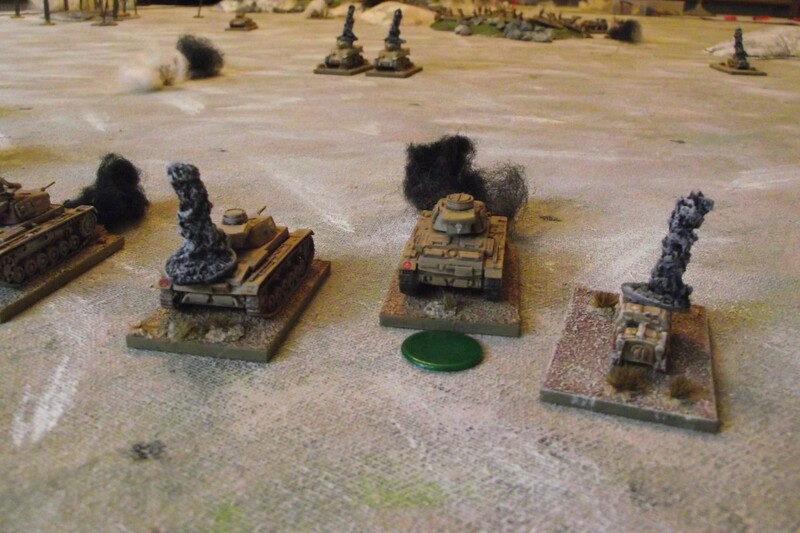 The view of the battle at the point I conceded, knowing I could rescue my tanks and retreat in good order. Kevin’s Matilda survived a 150mm barrage, and at least 4 shots of 47mm anti tank fire – it was blessed. It was also quite often pinned, so didn’t get far!! Kevin out scouted me, which meant he could place his scouts out before we deployed. He placed a sniper scout on a hill on my flank which was a real pain – I had to disembark a whole section to flush them out. On the whole a good game. A few things we are still not sure of – such as indirect artillery fire on armour – what penetration value do we use? Also we put some house rules in – we now define what type of supply column it is – Tank/Gun, Small arms, Petrol. I’m quite happy with the repaint of my cloth as well – I finally found a good tone to use – Soft Hessian – and it made the table look really good. I need to concentrate on getting some dune like stuff, and some terrain that symbolises soft sand. I also need to find a nice simple way of recording ammunition used.